Did you measure the base of your machine? 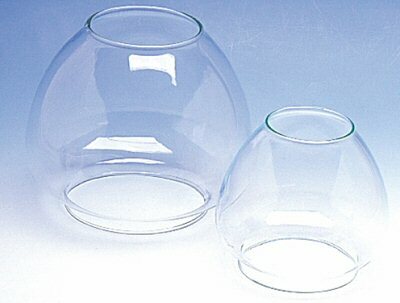 Gumball Bank Replacement Glass Globe for 9", 11-12", or 15" Gumball Bank Machines. Be sure to measure the base of your machine as shown above in the pictures above to ensure you get the correct globe replacement for you Carousel Gumball Machine. 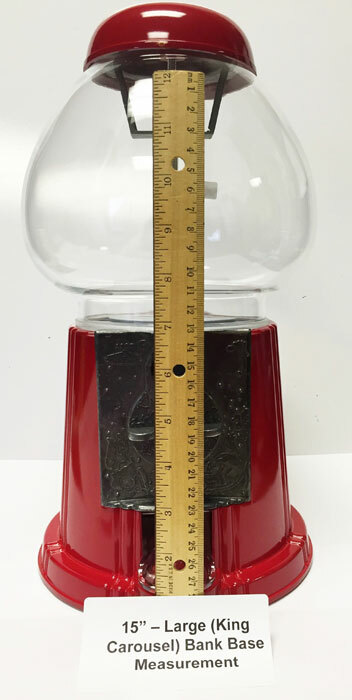 The measurements (9 inch, 11 or 12 inch, or 15 inch) are the measurements for you your gumball machine when it's fully assembled with the globe intact, it is not the actual measurement of the globe. Gumball/Candy Bank Replacement Glass Globes for sale! Need a replacement globe for your Carousel Gumball Machine? Check them out and all our great gumball/candy banks and gumballs! Shop Now! These globes with fit both Carousel Gumball Machines and CHH Gumball Banks. My grandson kicked over the gumball bank and broke the glass 12 years ago. Unable to locate a cost efficient replacement it was relegated to the corner of my closet. I don't recall how I came across your site, but I am so glad I did.It was well packaged and arrived early, and it fit perfectly. My 3 year old grandson accidentally dropped my gumball machine while trying to get a gumball. I didn't know where to start looking for a replacement. I tried eBay, Amazon and even offer up. To be honest I don't even remember how I found your website. But very happy I did. Ordering was fast and easy, and received it in the mail rather quickly. Thanks for making me a very satisfied customer. Fast shipping and carefully wrapped. Very pleased.